Every time I see a commercial for a new car, I can’t help but cringe a little when the price comes on the screen; I’ve paid less in rent than some of these cars would cost to own for a month. However, despite the rising costs of ownership, having a vehicle is as much a need as a want for many people, especially in areas where good public transportation isn’t an option. To make buying a new car more affordable, some small business owners are turning to the GM BuyPower Business CardTM from Capital One®, which allows you to start saving for your next new car just by making everyday purchases. 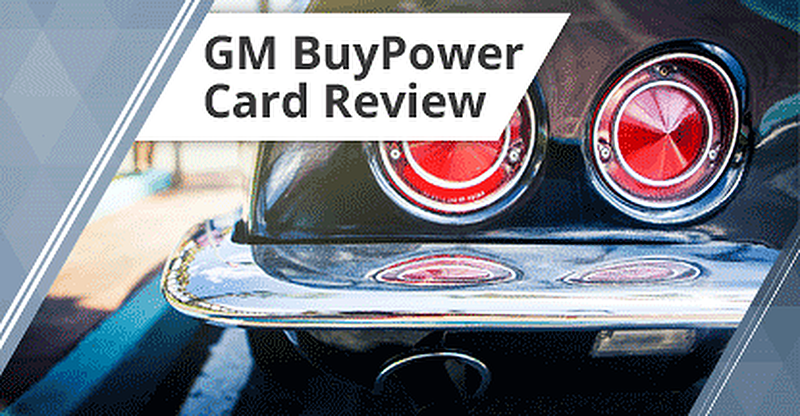 Use the navigation to learn more about the GM BuyPower Business CardTM from Capital One®. Applying for the GM BuyPower Business CardTM from Capital One® is easy, and well-qualified applicants can be approved in just a few minutes when they apply online through the website or our offer below. Saving with your GM BuyPower Business CardTM from Capital One® won’t even cost you anything — there’s no annual fee. To top it off, your new purchases can qualify for an introductory 0% APR, making it even more affordable to start planning for your next new car. Many of us are taking advantage of credit card rewards these days — usually in the form of airline miles or cash back rewards — but the GM BuyPower Business CardTM from Capital One® is in an entirely different league. Every time you swipe your GM BuyPower Business CardTM from Capital One®, you are actually earning toward your next new car. As with the cash back we’re all used to, the GM BuyPower Business CardTM from Capital One® works off a percentage; you’ll earn 5% Earnings on purchases of GM parts, accessories and service at authorized GM Dealers, 3% earnings on purchases at gas stations, restaurants and office supply stores, and unlimited 1% rewards on all other purchases. Keep in mind that balance transfers will not qualify for rewards; you can only generate earnings on new purchases. Earnings are reported each month on your billing statement or can be checked online through the Capital One website. Not only do your earnings never expire, but there is no limit to how many you can accumulate — or redeem. When you’re ready to buy or lease your new car, simply redeem your earnings to see the savings. When talking about the benefits of the GM BuyPower Business CardTM from Capital One®, you have to start with the rewards, which can be worth thousands off the total cost of the purchase or lease price of a new vehicle. The table below shows the potential earnings based on your average monthly credit card purchases. So, if you use your GM BuyPower Business CardTM from Capital One® to pay bills and make purchases totaling $1,500 a month, you could earn over $500 toward your new car in just one year. If you’re leasing a car for $250 a month, that’s two free months of new-car smell. Additionally, because the GM BuyPower Business CardTM from Capital One® is powered by Mastercard®, you get all of the benefits that come from being a part of the World Elite™ Mastercard® family. Organized into categories such as “Peace of Mind” and “Travel Perks,” these benefits include things like price protection and extended warranties for purchases made with your GM BuyPower Business CardTM from Capital One®, as well as rental car insurance and personal concierge services. The first step to redeeming your BuyPower rewards is to choose your new GM vehicle. You can use the General Motors vehicle selection tool to browse the latest cars, trucks, and SUVs for your perfect match. BuyPower rewards can be redeemed toward the purchase or lease of a new Chevrolet, Buick, GMC, or Cadillac. Once you’ve found the vehicle you’d like to buy or lease, head on over to a local authorized Chevrolet, Buick, GMC or Cadillac dealership. Make sure to ask about current offers and incentives to get the best deal, and don’t forget to ask about exclusive cardmember deals. Once you have a price, applying your rewards is as simple as telling your dealer representative. You can decide to use your rewards as a down payment, to purchase an optional equipment upgrade, or put them toward the purchase price to help lower your monthly payments. While there are no limits to the amount of earnings you can collect, or redeem, there are a few limitations on how you redeem them. To start, your BuyPower earnings cannot be used in combination with the GM Employee or Supplier Discounts, though the GM College and Military Discounts are eligible. What may be of most concern to many is your BuyPower earnings can only be redeemed toward the purchase or lease of a new GM vehicle. You cannot redeem for cash, gift cards, or travel rewards, or toward the purchase of a used vehicle. Whether you commute to work, need to get around your rural community, or just want to get away for the weekends, having a car can make a big difference in your quality of life. Keep the cost of that quality down by saving for your new vehicle with a GM BuyPower Business CardTM from Capital One®.